Choose 1st garde to 5th grade Math, English and Science worksheets for school kids online.Acadzone india's leading textbook store for students is the best Source to purchase worksheets for kids online. 6. 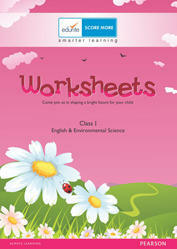 No of pages included in the Class 1 English & Environmental Science-Worksheet is 257. 6. No of pages covered in class 1 maths worksheets is 281. -Bright colorful pages to intrigue and engage the child. -Variety of activities to reiterate the understanding of the concepts. -Stiffer pages that can withstand rough handling. -Designed by experienced educationalists and in tune with the current CBSE-NCERT syllabus.